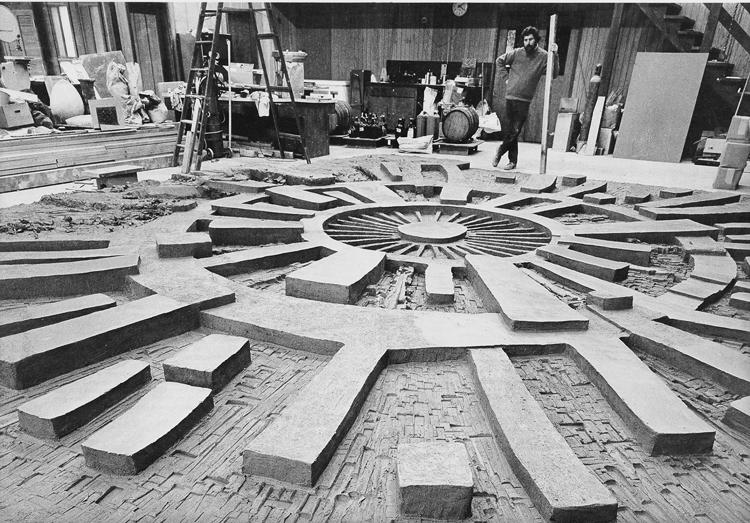 Bitters is seen here in the 1970s creating a sunburst mural 22 by 26 feet out of 11 tons of clay. This long shot of the Duncan Ceramics Products buildings show how Bitters transformed the business' facade into a grand showpiece of art. Bitters' crew assembling his art—piece by piece. "We've done 44 residential commissions and have five or six currently going," says Nadeau, owner with his wife, Joanna, of Ten10, a Los Angeles design firm and dealer in mid-century furnishings and art. 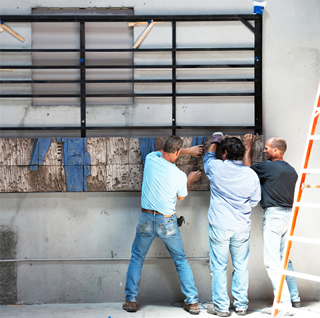 Nadeau has been seeking clients who live in mid-century modern homes or otherwise appreciate that aesthetic. Bitters' commissions include clay murals for interiors and gardens, fountains, freestanding figures, and more. Bitters' studio is so busy it's hard to squeeze in time for his more personal work, destined for a gallery show next year. He uses a couple of part-time assistants, mostly to turn out his production pieces—hanging lamps, pots, and his popular birdhouses. And he finally conquered Northern California, after decades of being shunned. A recent show at Heath Ceramics' Boiler Room Gallery in San Francisco "just went dynamite," he says, virtually selling out and leading to talk about Bitters becoming an artist-in-residence and collaborating on wares. "For me, his work has such a sense of place. It's so Californian," says Renee Zellweger, a curator and designer (but not the actress), who organized the Heath show. 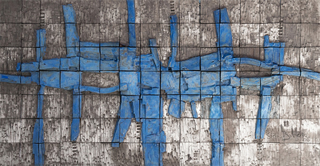 "Peter Voulkos's work is one thing. But look at Stan, the scale. He's really moving into a different place with his environmental work. You just don't see that [anywhere else]. To sit in front of clay and start thinking in that scale." She says there's even a documentary in the works about Bitters. "Everything looks good right now," Bitters says. For Bitters, "good" doesn't mean buying a sports car. It means being able to buy enough clay and Korten steel to produce. When Bitters is doing what he wants to be doing, he's working, which he does seven days a week, eight hours a day, down from the 12-hour shifts of his younger years. Bitters' story says much about the evolution and devolution of what once was called the Arts and Architecture Movement, which grew up in the 1950s, largely in California, with the goal of integrating modern art into modern architecture. Bitters, who got his education in the late 1950s, came late to the Arts and Architecture game but adopted it enthusiastically, drawn by the bigness of working on an architectural scale and by the potential to affect how people live.